There’s a way for plus size women to look great in tight belts. This is NOT about reprogramming your self-worth. It’s an objective, straightforward, INSTANT way for even very large women to slay a tight belt. 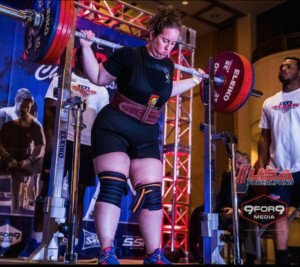 Nobody will ever tell you you’re “too fat” to wear a weightlifting belt while you’re lifting weights. 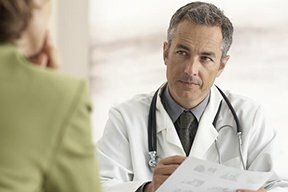 The title of this article, and the first three lines of it, are 100 percent true. If you’ve been feeling bummed out about the plus-size of your body, it will be increasingly difficult to keep feeling this way as the weight of the barbells you lift gets higher. You’ll never feel too big to wear the kind of belt shown below. Ogechi Akalegbere performing the deadlift in competition. Picking a 200 pound barbell off the floor – or even when you break the 100 pound mark – will give you far more confidence than simply putting on a bikini. “When I wear my belt it’s almost like I automatically stand in attention,” says Ogechi Akalegbere, 31, a plus-size competitive powerlifter for six years. “My posture is upright, my chest is up, my core is engaged. I’m ready for the lift. Wearing the weightlifting belt is optional for competition — if you’d like to compete one day. Many women train for fitness only — with or without the belt — but for very heavy lifts, it helps give support. No matter how big or “fat” you are – no matter what your dress size or how “huge” your thighs are – NOBODY will ever tell you that you shouldn’t be wearing this kind of belt, nor the clothes that typically come with it. This very full-figured woman rocks her tight belt. I’m a former personal trainer. My answer to the question of “How do I get started in strength training?” is to join a gym. Afraid that people at the gym will stare at your very large body? Check out a powerlifting gym. All the equipment is there for your fitness journey. 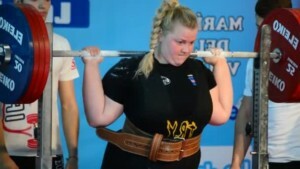 However, it’s SO UNLIKELY that anyone in a powerlifting gym will sneer at the new member because she’s very big. Fact is, I just don’t think it ever happens. Take things slowly as your body adapts to strength training, and focus on mastering excellent form – especially with the barbell squat and deadlift. 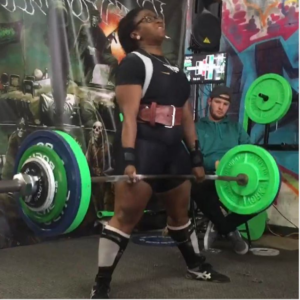 Ogechi Akalegbere has a blog, gechmeifyoucan.com, and a YouTube channel, where she chronicles her training and other passions. Ogechi has a newly launched apparel business, Adaeze Designs: creating clothing that inspires.